As it turns out, sitting at a desk all day is, well, not that good for us. 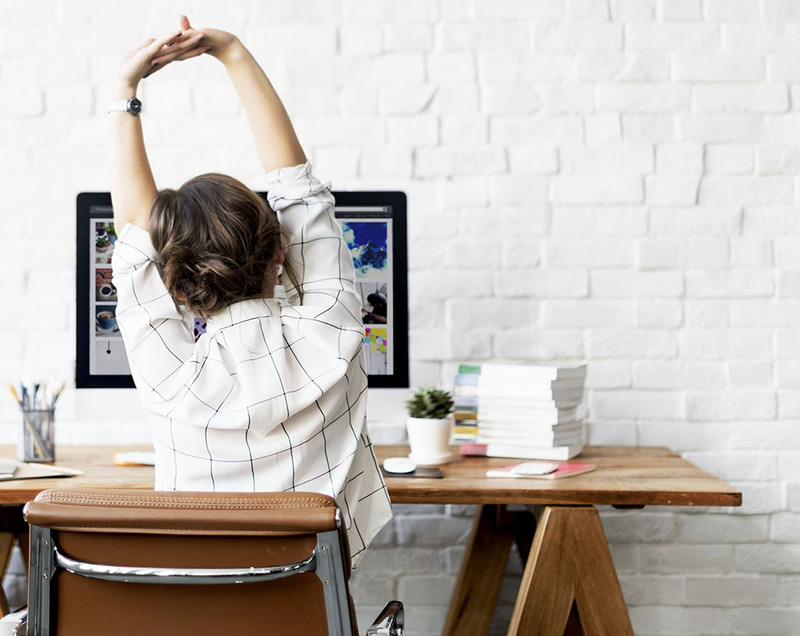 Research shows that a lack of physical activity during the working day — known as a “sedentary lifestyle” — is bad news for your health in more ways than one. Sitting for too long doesn’t just affect your waistline: it also affects your mood, your memory, and even your sleep. The problem is that this sedentary lifestyle is only getting more common as office workers pull longer hours to catch up with the demands of a world accelerated by technology. If you’re holding your neck still for long periods of time, chances are it’ll start feeling pretty stiff. To help strengthen your neck, place your palms on your forehead and gently push your head forward, pushing back with your hands. Do this for a few seconds, stop, and repeat. Sure, it looks a little strange, but it feels really good. Loosen up your neck and increase blood flow to that big old brain of yours with a head roll. Tuck your chin into your chest, then slowly rotate your head around your shoulders until you’re back to the starting point. Then, go back the other way. If you put headphones on, it’ll just look like you’re really into the music. Don’t know the answer to something you’ve been asked? Take the opportunity for a few shoulders shrugs. Lift your shoulders to your ears and hold for a few seconds before dropping to help strengthen the muscles in your back which improves posture, reducing back pain. Don’t do this too often, though; otherwise, people may think you really don’t have an opinion. If you sit at your desk with your arms out in front of you, it’s likely that the sensation of your shoulder blades touching is pretty alien. Nevertheless, it’s important to do this to help open up your chest and relax the muscles across your upper back. If you yawn while you do it, no one will bat an eyelid. Work on those pectorals and triceps with this easy exercise. Press your palms together in front of your chest and press them against one another. Hold for a few seconds. You should feel some tension in your arms, shoulders and chest. Starting in the same position as in exercise number 5, turn one hand the other way around so one thumb points to the ceiling and one to the floor. Hook your hands together by your fingers and pull for a few seconds. This helps strengthen your biceps without having to get the dumbbells out. It probably won’t give you a washboard stomach, but tensing your abs every now and again can help improve your core strength. That means your posture is better supported: goodbye, back pain! You can take this up a gear by gripping the edge of your desk and swivelling in your chair left and right with your feet off the ground. You might be sat on them all day, but that doesn’t mean that your buttocks are getting all the exercise they need. Tense and hold your glutes for 5-10 seconds, release, and repeat. You can sync it up to whatever music you’re listening to at the time to keep up a steady rhythm. Without regular pressure put on them, your thighs can quickly weaken. Give them a quick booster by pushing your knees together. Hold them for a few seconds and release. If you have slim thighs, put a book between your legs and press against that instead. You should feel the benefit in your groin and around your hips. One of the great things about a desk is that you can give your legs some exercise without anyone noticing. Put your feet together and slowly raise your legs until they’re at a 90-degree angle to your body. Hold for a few seconds, then slowly lower them again. Do this a few times until you can feel the burn in your calves. Doing a little exercise at your desk a few times a day is an easy way to look after your body while you’re at work. Remember to pair it with regular, more active exercise after work to keep your heart healthy, your blood flowing, and your brain supplied with the oxygen it needs to do a fantastic job. Nick Pollitt is Managing Director at office furniture suppliers DBI Furniture Solutions.